Prisons across the United States and elsewhere have instituted programs that pair inmates with animals in need. The benefits to the inmates are many: They can cuddle with the animals, learn new skills, practice compassion and consideration, and some even earn money or other privileges for their work. In turn, the animals benefit from the one-on-one attention. Here are a few of the many such programs offered by correctional institutions. One of the oldest prison pet programs in the U.S. is the Prison Pet Partnership Program at Washington State Corrections Center for Women. Launched in 1981, it is a collaboration between the prison, Washington State University, Tacoma Community College, and Dominican nun Sister Pauline. Prison inmates are trained to raise puppies, socialize them, and train them for service to disabled people. The dogs come from animal shelters. Those that don’t quite make the grade to work as a service dog are trained in obedience and offered to the public for adoption. The program also serves as vocational training for inmates, who can earn certification in pet training and grooming. Early on, the program slashed the recidivism rate among inmates who participated for at least two years. Now in its 35th year, the program also offers boarding and grooming services to the public. Starting in 2009, the Luther Luckett Correctional Complex in LaGrange, Kentucky, ran Camp Canine, which soon moved to the larger Kentucky State Reformatory. Dogs from animal shelters are sent to the camp to be trained by correctional center inmates. Eighteen inmates live with the dogs in a special wing of the prison, and rotate dogs so that each trainer works with all the dogs in the program. Professional trainers oversee the program and teach the inmate trainers. The goal is to turn hard-to-adopt dogs into well-trained and socialized pets, adoptable through the Humane Society of Oldham County. Another goal is to give inmates a chance to build relationships with the dogs, and to gain new skills they can use after they leave the prison. A volunteer organization called Cuddly Catz began a program at Larch Corrections Center in Yacolt, Washington, in 2011 to rehabilitate cats at the prison. Cats that were considered un-adoptable because of behavior issues were diverted to Larch instead of being euthanized. They came from neglectful or abusive situations, and needed to learn how to live with humans. Inmates who qualified for the program kept a cat with them at all times in the minimum-security Silver Star unit, and had litter boxes and scratching posts in their rooms. They spent one-on-one time with the cats, helping them to overcome their fear of people. Occasionally, inmates were charged with caring for newborn kittens that needed feeding around the clock. The inmates benefited, too, by taking on a sense of responsibility for the cats. They also got the chance to be gentle. Eventually, the cats were deemed ready for permanent adoption. In the five years since the program began, Cuddly Catz has dissolved, and is now known as the Larch Cat Adoption Program, working through the West Columbia Gorge Humane Society. However, they've recently begun a dog program at the Larch Corrections Center, too. In fact, all Washington state prisons run some kind of animal training or adoption program. The federal Bureau of Land Management oversees America’s wild horses. The population of wild horses has risen since they were put under the government's protection, so in order to stabilize the numbers, horses are being adopted out. But it takes some time to convert a wild mustang into a pet. The BLM is working with the Arizona Department of Corrections and Colorado Correctional Industries in a program called WHIP—the Wild Horse Inmate Program. The program is supervised by professional horse trainers, who teach inmates the art of gentling and training horses. Horses are available for adoption after they’ve completed the program. You can see them in Canon City, Colorado, and in Florence, Arizona. DAWGS in Prison, a program at the Gulf Correctional Institution in Wewahitchka, Florida, takes in unwanted and often abused dogs. (DAWGS is an acronym for Developing Adoptable dogs With Good Sociability.) Inmates socialize them and train the dogs in basic obedience, so they’ll be able to fit into new families when they are adopted. Inmates who participate in the program learn skills as trainers and handlers, and live with the dogs in a special work camp. 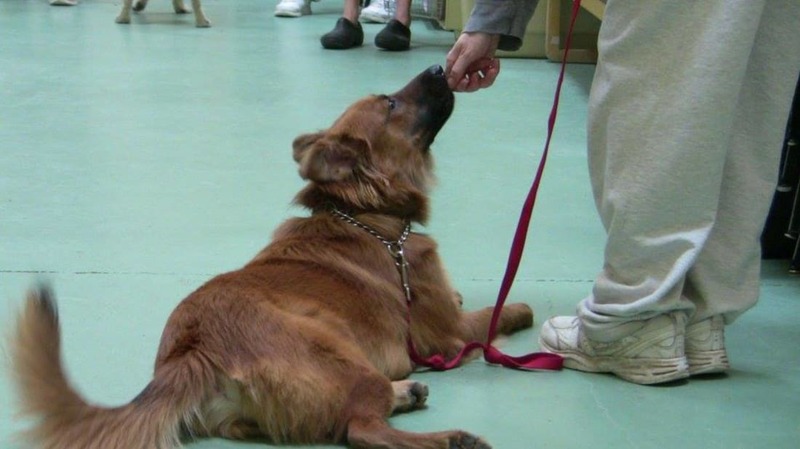 A class of dogs graduated just recently, as the program celebrates its seventh anniversary. See some of the adoption stories on Facebook. The Canine Performance Sciences Program at Auburn University’s College of Veterinary Medicine breeds and trains dogs, mostly Labrador retrievers, to detect the smells of bombs, viruses, poisons, and other dangerous materials. The yearlong program turns playful puppies into highly disciplined service dogs ready to perform. Puppies that show promise are selected for the training program, and are sent to one of five prisons in Florida and Georgia for basic training and socialization. They spend up to six months learning obedience, loyalty, and basic tracking skills. Meanwhile, the inmate trainers can earn continuing education credit through Auburn. After six months, the dogs are returned to Auburn for advanced scent training, which leads to jobs as canine security experts. Some dogs are also involved in research, such as the few that were specifically trained to sit still in an MRI machine so that researchers can study their brains while they are stimulated by scent, and the humans are given a certificate that they can use to hopefully get a job with dogs after getting released. Inmates at the Norfolk County Jail in Dedham, Massachusetts, have an opportunity to work with raccoons, foxes, birds, and other animals in need at the New England Wildlife Center in Weymouth. The program was launched in 2014 by Sheriff Michael Bellotti to help inmates learn “respect and discipline” as they help care for the sick and injured animals. They also learn compassion and skills that will help them when they are released. The nationwide program Puppies Behind Bars works with several correctional facilities to train dogs from an early age in one of two careers. Some dogs are raised and trained to be service dogs for wounded veterans, while others are trained to detect explosives. Inmates in the program receive extensive training and ongoing supervision. The dogs are first taught to get along with humans, then go through basic obedience training, which leads to more specialized training. The program began in 1997 at the Bedford Hills Correctional Facility for Women in New York, where inmates socialized puppies that later went on to become guide dogs for the blind. After 9/11, the explosive ordnance training program was added. In 2006, dogs began to be trained as service dogs for the many wounded veterans coming home from Iraq and Afghanistan. When a veteran is matched with a service dog, the veteran comes into the prison for a 16-day training course in using the service dog. Both the inmates and the veterans benefit from working together with the dogs. Puppies Behind Bars is now operating in six prisons.